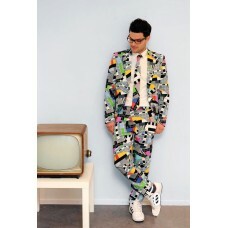 Testival mens suit & tie - Test Card TV. Testing 1, 2, 3... Back in the day when boats were made of wood and men were made of steel, you would see this screen on the TV when there was an outage on TV. These days, everything is digital and everyone seems to have forgotten this test card screen. Therefore, we decided to go back in time with this design. The colourful suit, which should be highly respected by most TV stars, comes with the tie. There are too many occasions when this costume can be worn.